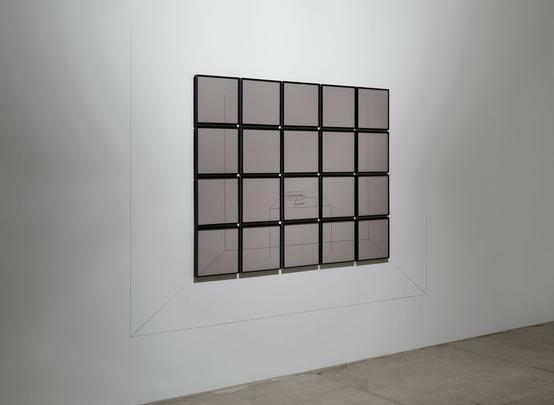 Marian Goodman Gallery is pleased to announce an exhibition of recent work by Giulio Paolini opening on Friday, February 6th which will be on view through March 13th, 2015. 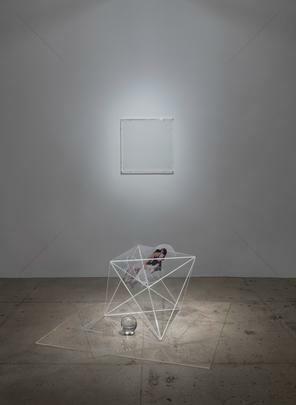 On view will be a range of works from 1987-2015, a selection of which were featured in the recent retrospective survey Giulio Paolini: To Be or Not To Be / Essere o non essere shown at Whitechapel Gallery, London (2014) and earlier at MACRO, Rome (2013). 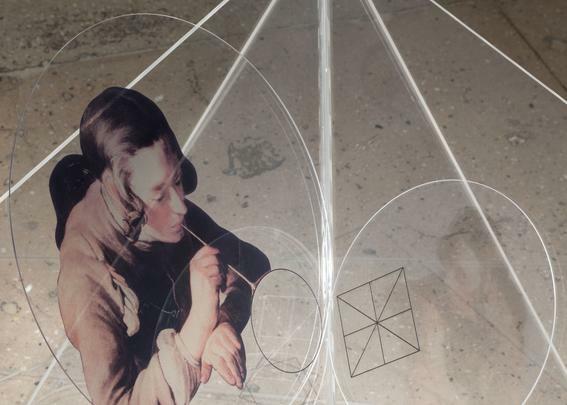 The works explore Paolini’s interest in the canon of art history, the notion of authenticity, and the interchangeable roles of artist and spectator as accomplices in the construction of meaning. 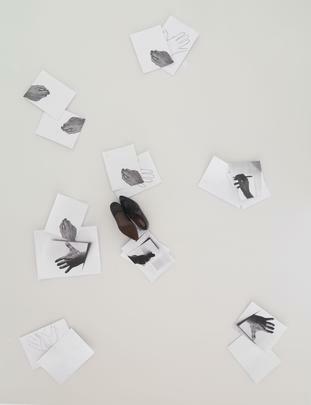 Rooted firmly between picture space and object space, they offer musings on the creative act, the private space of the studio, and the coming into being and exhibiting of the artwork itself, as well as a personal vision of the non-authorial nature of the artist which has become increasingly central to Paolini’s work. 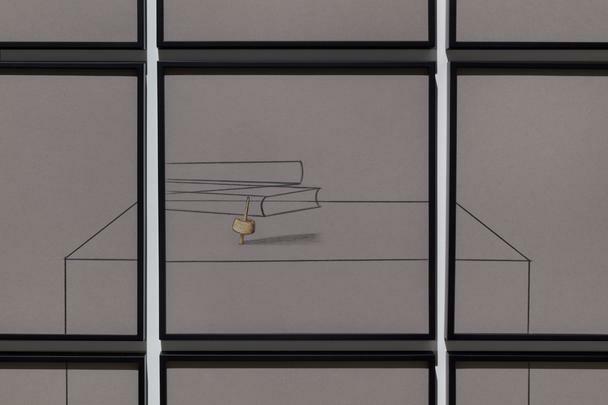 Explored through staged and juxtaposed tableaux of fictions, relics, citations, and optical illusions, the exhibition presents an infinite game of inversion between beholder and beheld, and a meditation on the mutability of the artist. 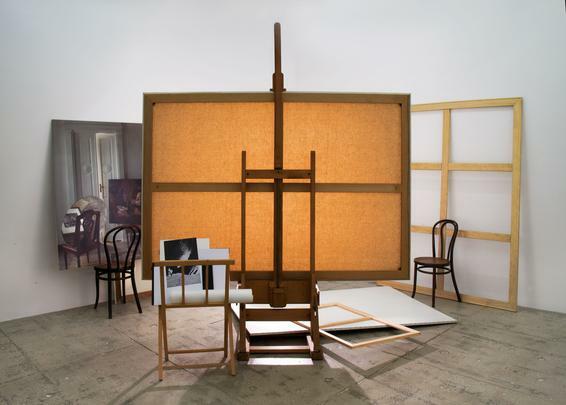 In the North Gallery L’autore che credeva di esistere (sipario: buio in sala)/ The Author who thought he existed (Curtain: Darkness falls over the Auditorium), 2013 depicts a work table in a central position within the space, over which a figure labors surrounded by a gallery of paintings along the wall, which in turn hosts a projection of images recording the perspectival lines of a studio. 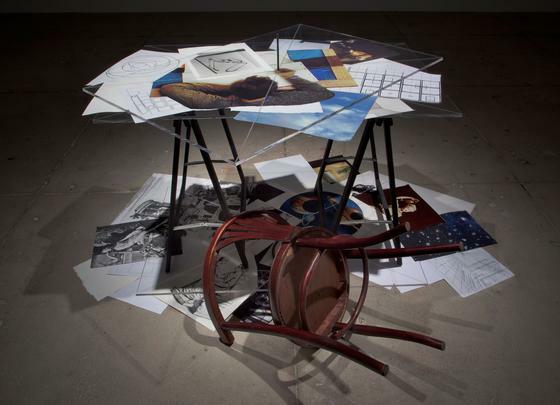 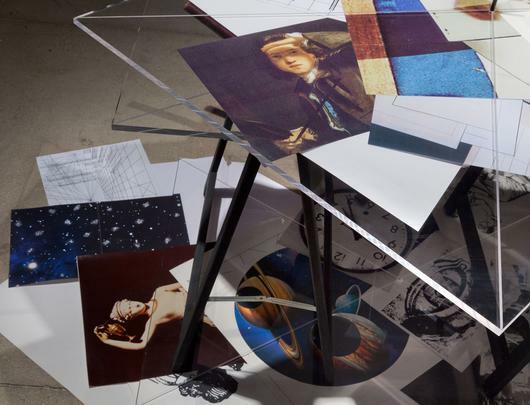 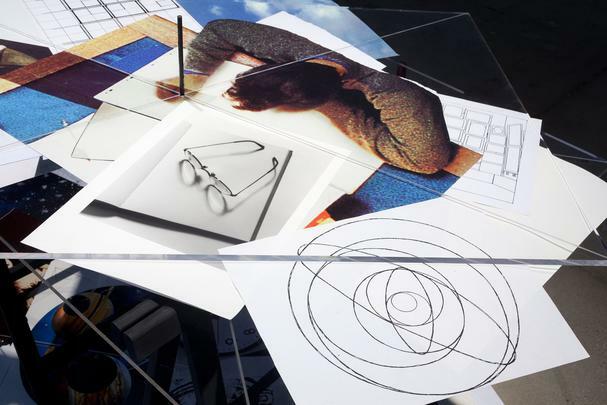 The table, pierced by a black pencil in a vertical position, serves as the hinge for a composite ensemble of photos and archival pages from the artist’s archive. 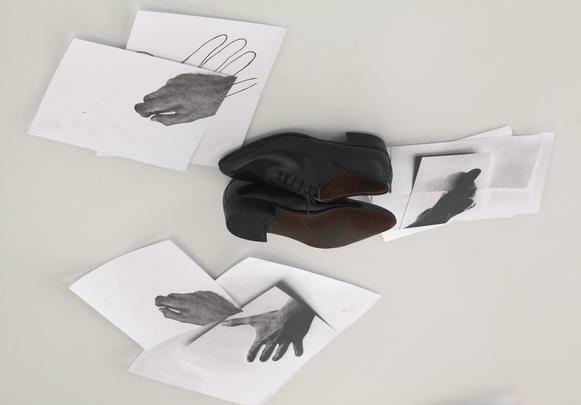 The dramatic tableau suggests the author’s hurried exit from a scene in order to watch the becoming of the work, as though he were a spectator awaiting the curtain to rise and the play to begin. 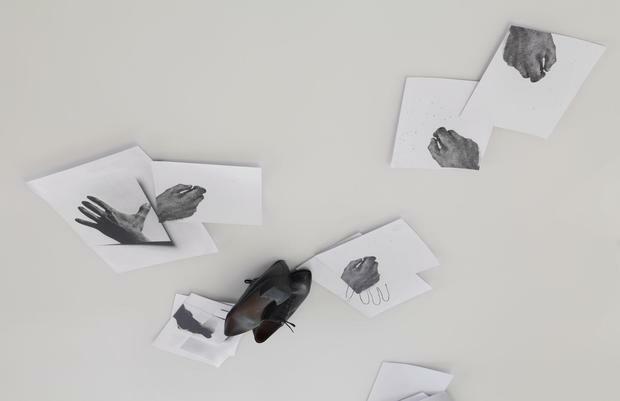 A series of four works continue on this theme. 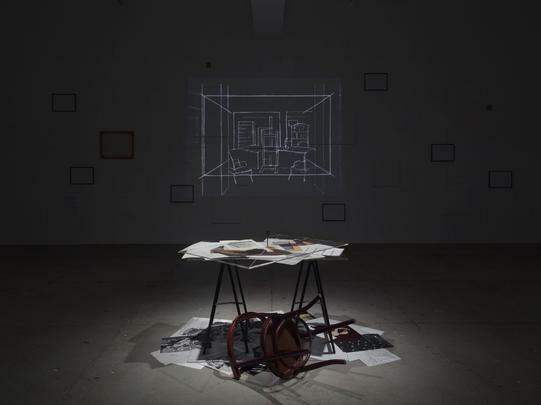 Come e/ Come se (As it is / As if), 2014 is comprised of twenty framed elements and forms a composite image of the drawing of a room- an artist’s studio depicting a table with books and a spinning top- in which a work appears to be in process. 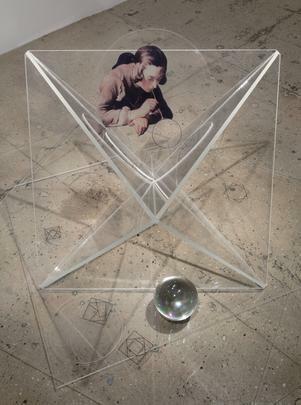 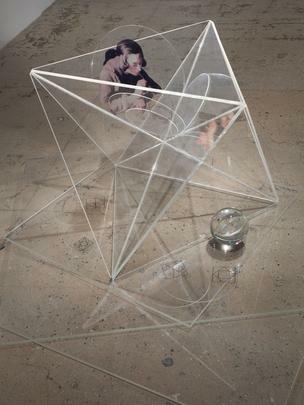 Alfa (un autore sense nome)/ Alpha (An Author without a Name), 2004-2015 features a wall drawing with an image of blue sky juxtaposed with a plexiglas polyhedron floor sculpture. 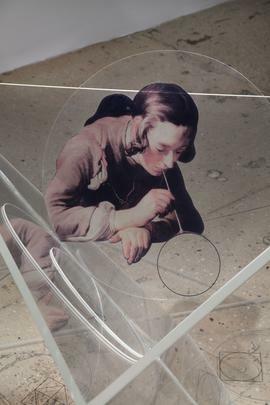 The latter, scattered with plexi rounds and a crystal sphere, crystallizes the accompanying image of a reproduction of the 18th c. blower of soap bubbles by Chardin, which in turn evokes the becoming of the artwork. 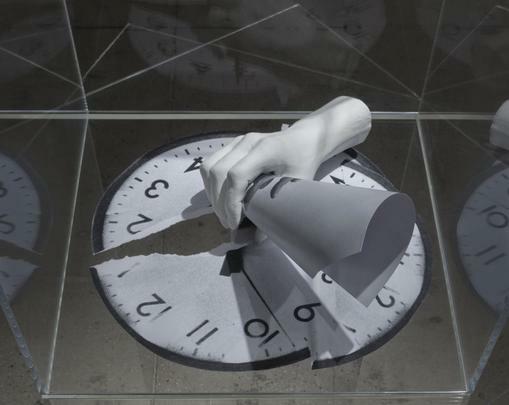 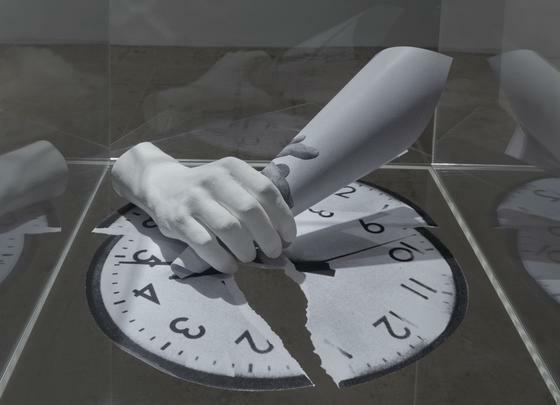 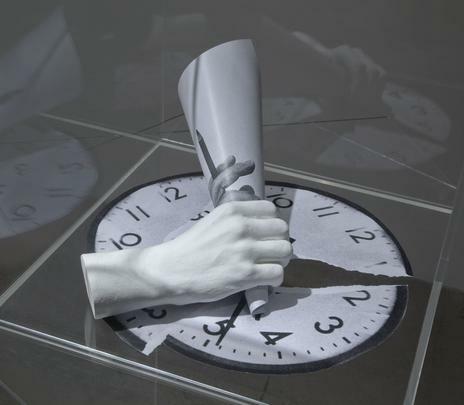 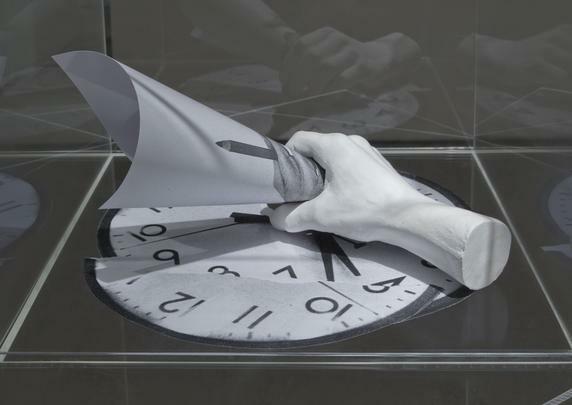 Next opening, 2014 consists of a plaster cast of a hand holding a photographic reproduction of another hand holding a pencil, and rests on two sheets of plexi; between them there is a collage of torn images of a clock. 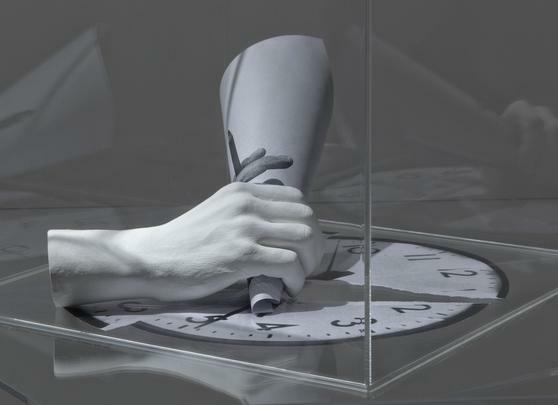 The work announces the moment when the hand will open and release the image it is holding, that is, the moment when a picture or new work will come true. 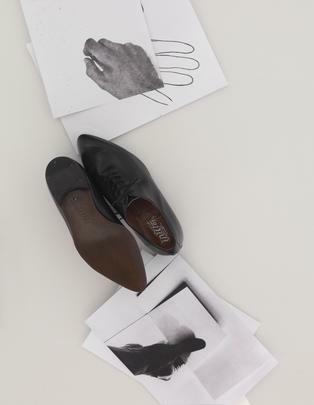 Finally, in Vedo (frammenti della decifrazione del mia campo visivo)/ I see (Fragments of the Decoding of my Visual Field), 1987, a pair of black men’s shoes and images of the artist’s hand appear on the ceiling, alluding to the artist’s irrevocable need to pursue the farthest reaches of imagination and make it his own. 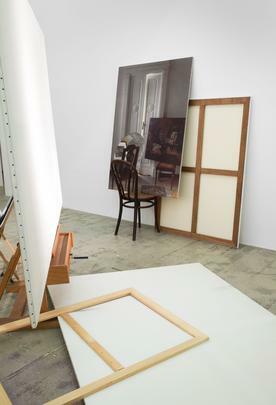 In the North Gallery Viewing Room, L’ospite/ The Guest, 1999-2013 constructs the following scene: a large canvas on an easel blocks our access to what seems to be an artist’s studio, recently abandoned to make way for a theater of its makers. 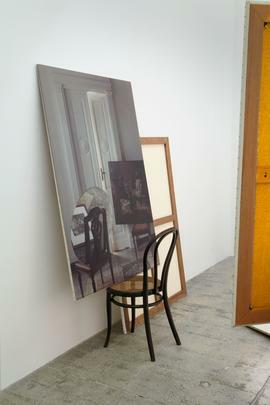 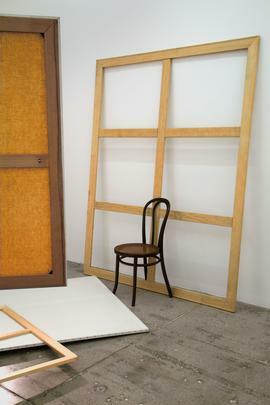 Behind the canvas screen, as in Velasquez’s Las Meninas, are two chairs, echoing those depicted in a photograph of a set up within Paolini’s own home, while a print cabinet features a portrait of Jorge Luis Borges in the process of signing a work and playfully ‘authenticating’ the scene. 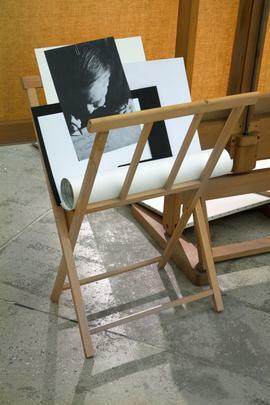 Paolini’s work has been widely exhibited since the mid-sixties. 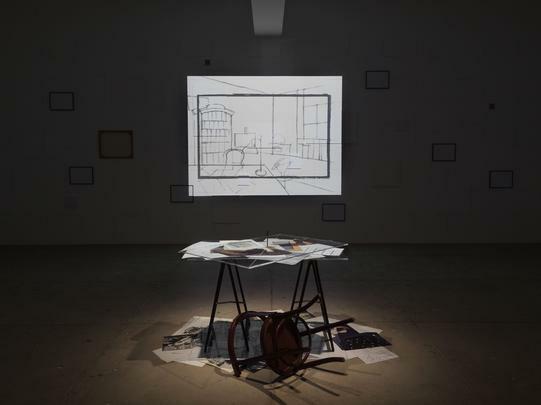 Recent solo shows include the aforementioned To Be or Not to Be, Whitechapel Gallery, London (2014); MACRO Museo d´Arte Contemporanea Rome (2013); Giulio Paolini. 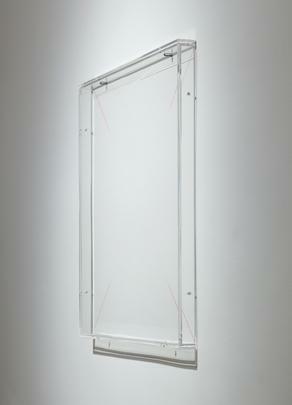 Gli uni e gli altri L'enigma dell'ora at the Palazzo delle Esposizioni, Rome (2010); L’Ora X. Né prima né dopo at the Museo Archeologico Nazionale di Napoli, Sala della Meridiana, Naples (2009); Fuori programma, GAMeC Galleria d'Arte Moderna e Contemporanea, Bergamo (2006) and Esposizione universale, shown at both Kunstmuseum Winterthur, Winterthur and Westfälisches Landesmuseum für Kunst und Kulturgeschichte, Münster (2005). 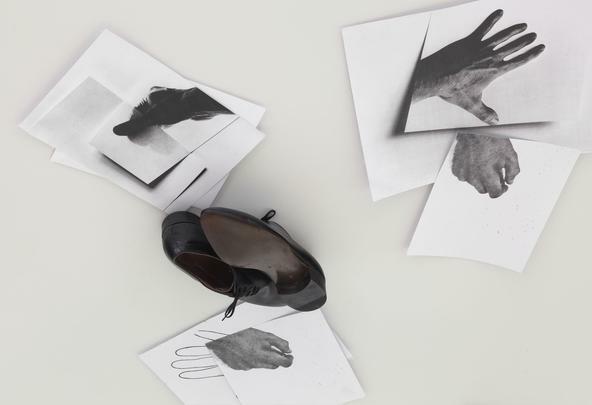 Current and recent group exhibitions include Equilibrium at the Museo Salvatore Ferragamo, Florence (through April 2015); Collection Study III: Art in Europe after 1968, S.M.A.K., Gent (through March 2015); Limits without limits. 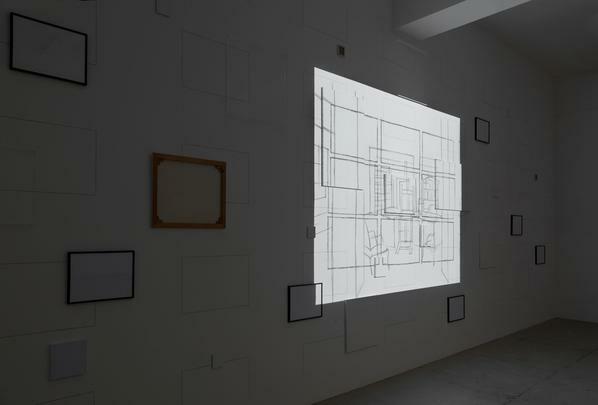 Drawings and traces of Arte Povera at the Fundação Iberê Camargo, Porto Alegre, Brazil (2014); Lo Clásico en el Arte at the Fundación PROA, Buenos Aires, Argentina (2014); Prima Materia at the Punta della Dogana, Francois Pinault Foundation, Venice (2013); Arte Povera. 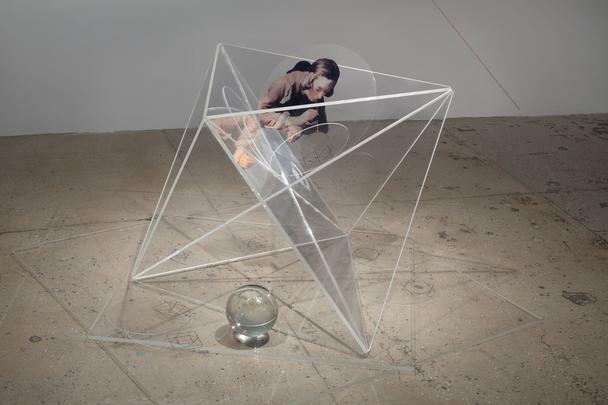 The Great Awakening at the Kunstmuseum Basel (2012); Light Years: Conceptual Art and the Photograph, 1964-1977, The Art Institute of Chicago, Chicago (2011); Arte Povera, 1967-2011, Triennale di Milano, Milan (2011); Che fare? 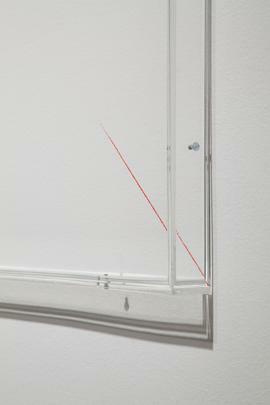 Arte Povera, Kunstmuseum Liechtenstein, Vaduz (2010). 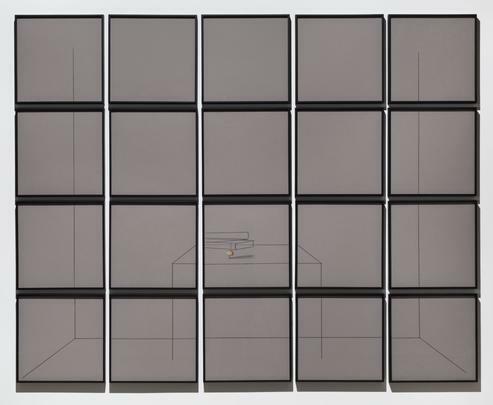 Paolini has participated in Documenta V (1972), VI (1977), VII (1982), and IX (1992), and the Venice Biennale (1970, 1976, 1978, 1980, 1984, 1986, 1995, 1997 and 2013). 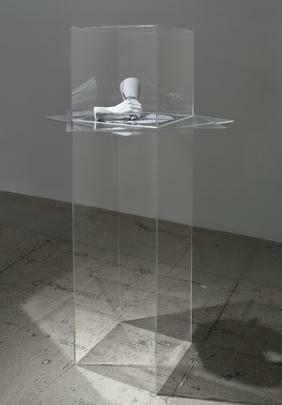 Paolini's various awards include a Premio Fontana (1975), a DAAD Fellowship (1981), and a Chevalier dans l'Ordre des Arts et des Lettres (1995). 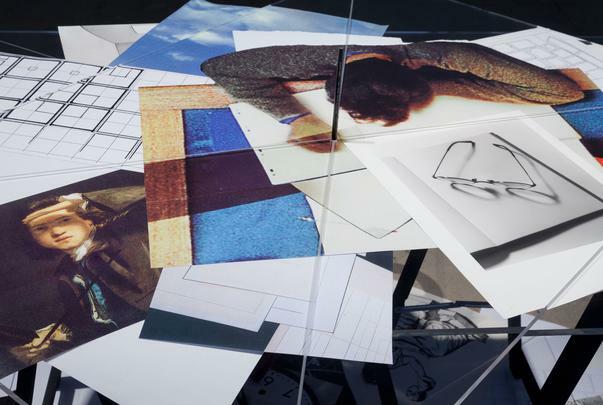 Please join us at the opening reception on Friday, February 6th, from 6-8 p.m.